You have probably noticed in this series of blogs, I talk a lot about “planning” a wedding reception, how we normally spend 25-30 hours in the “planning” process, etc. You might be asking yourself “That all sounds wonderful, but what all goes into “planning” a wedding reception? What happens in those 25-30 hours?” So that’s what I wanted to talk about in today’s blog…the entire process. Everything I talk about in this blog is what I personally do in the planning process, other DJ’s have different ways they may do things, but this process is what has worked well for me over the years and it’s also made so many brides and grooms happy. Usually, the first step in the planning process is for the prospective bride and groom to learn about SN DJ Entertainment. Normally they hear about us through an internet search, a friend, family member, a bridal directory, or often a wedding show (such as the Beautiful Beginnings Bridal Expo). They’ll usually visit the website, read the information there, then contact us. Once they contact us, we usually send them a wedding informaiton packet which contains some information about our services. It describes each one of our wedding packages, it gives a walkthrough of the typical wedding reception from start to finish, and it includes some sample planners from past clients’. Usually they will contact us after they have had a chance to look at our packet, and I’m the one who returns their email / phone call..
After they have looked at our wedding packet and contacted us, we will usually set up a consultation, normally at Starbucks. Since it’s harder for people to meet during the day, I schedule a lot of consultations in the evenings and on weekends (depnding on our schedule). The consultation serves 2 purposes…it gives the bride and groom the chance to get to know me better, but it also gives me a chance to get to know them as well. It’s a two way relationship. During the consultation, I like to find out how they met, how they got engaged, and what they are looking for in a DJ / emcee. We spend time going over information and then I answer any questions they may have. We usually talk about the contract, and they don’t have to sign the contract immediately (although some do, and they also pay their retainer fee at that time.) If they want to take a few days to talk about what we discussed, read over the contract, and absorb everything, they are certainly welcome to do that. Usually we will schedule another consultation to sign the contract, or they may mail the contract (with their retainer fee). The real planning process begins…. So now that I have received their signed contract and retainer fee, I then send them our wedding informaiton form and our reception planning guide. Our wedding information form is the form we will use to put their planner (sequence of events) together. The reception planning guide is a step-by-step guide on planning a wedding reception. It contains a lot of helpful tips, suggestions, and it walks the bride and groom through the wedding information form. I’ve had so many brides tell me this guide made their planning so much easier…it really is a stress reliever. During this time, the bride and groom may also contact me for suggestions and I’m always there to help them. As the big day gets closer, we may schedule another consultation at the venue to discuss where to set up, the floor plan, and other important details. About 30 days before their wedding day, the bride and groom will send their wedding information form back to me. At that point, I will then spend many hours in the “Oval Office” working on their planner, making sure I have the music the bride and groom requested, and programming the computer specifically for their reception. Once I get everything typed up on their planner, I then send it back to the bride and groom. This gives them a chance to look it over, make sure the names of the wedding party are correct, and everything is exactly how they want it. If we need to make any corrections, we will do that at this time. Once the bride and groom have given me the approval their planner is how they want it, I will then send copies out to each and every one of their vendors (wedding coordinator, photographer, videographer, caterer, etc). That way, all the other vendors will know what we will do and when we will do them. During the last couple of weeks before the wedding, I am usually spending time making sure my backup computer has all the music the bride and groom want at their reception, and I program the backup computer to match the main computer. If I am performing the wedding ceremony (in addition to the reception), I will usually attend the rehearsal. I think it’s important for the DJ to attend the rehearsal because it gives the bride, groom, and everyone in the wedding party a chance to hear the music they will be walking out to. As a DJ, and someone who has done MANY wedding ceremonies, I can tell when it’s time to change the music when it’s time for the bride to come out. But my attendence at a wedding rehearsal is mainly to give the bride a “peace of mind” and to make sure everyone is familiar with the songs they will come out to. If I’m not involved in the ceremony, usually I spend the night before the wedding doing some last minute checks from the Oval Office. I’ll double check the planner, I’ll double check the music, and I usually double check my main computer and backup computer to make sure they are ready to go. It’s usually at this point I load the DJ equipment in the van, making sure to go over my checklist to ensure everything is there. Now the big day has arrived. On the morning of the wedding, I’m usually up early. I usually fix some coffee and head straight into the “Oval Office”. Once again, I double check the wedding planner, double check the computers, and I make sure everything is lined up the way it us supposed to be. At that point, I’ll go ahead and get ready for the day, shower, get dressed, etc. I will once again double check the equipment and make sure I have everything I need. I then make sure I have plenty of time to get to the venue to set up. (If I’m going out of town like to Ft. Walton Beach, Panama City, Destin, Mobile, or somewhere like that, I have to account for my travel time too.). Usually I’ll stop off and get something to eat en route to the venue. Set up time is usually about 2 hours, performance time is around 4 hours, then we need at least an hour to break down. During the reception, I personally stay in contact with the bride and groom to make sure everything is going the way they want it. I also stay in contact with their vendors so they know when we are going to do things and can be ready. I’m also in charge of letting the guests know when events are going to happen. (For example, we want to make sure we have everyone’s full attention when it comes time for the bride and groom to cut the cake or when it’s time for their first dance. I make sure all the guests, the vendors, and everyone at the reception know when these important events are coming up.) The wedding day alone is easily a 12 hour day when we factor in the last minute checks, traveling to and from the venue, the setup / breakdown time, and of course, the “performance” time. As you can see, that’s how we can spend 25-30 hours on your wedding starting with the first consultation until we arrive back at home at the end of your reception. As we have said before, most people only “see” the 4 hours of “performing’ time at your wedding reception, and sometimes they believe that’s all we do. (Yes you have probably heard it before, “The DJ just sets up some equipment, plays music for about 4 hours, packs up, then leaves, so he only “works” 4 hours every weekend.”) But as you can see, we do a lot more than just “perform” those 4 hours you see at the reception…there’s a lot of work and planning that goes into making sure everything is ready on your wedding day. So, when you are shopping around for a professional mobile DJ for your wedding, please keep this in mind……if the DJ’s prices seem high, consider all the planning and work he will do into making your wedding day special. When you consider he will spend at least 25-30 hours on your wedding, the price really isn’t that expensive because you are receiving a lifetime full of positive memories, not to mention you will be saving yourself a lot of stress when you hire a professional. If you have any questions at all, please feel free to contact me anytime. I will be glad to answer any questions you may have. See you in the next blog! Stacey Noles is a professional mobile DJ in Pensacola, Florida. For more information on SN DJ Entertainment, please visit www.sndjpensacola.com. This is actually a photograph from a wedding I did recently at the Nix Center in Fairhope, Alabama. This was a perfect setup because you will notice the DJ table is at the edge of the dance floor, there weren’t any tables shoved up against the DJ table, and our speakers were centered where they could cover the whole room.It worked out great because there were no obstructions for the lights, there wasn’t a chance of anyone tripping, and everyone got the full enjoyment of our sound system. So the moral of this story is when you start figuring out the room layout, please make sure your DJ’s set up location is a priority. Make sure you have him set up as close to the dance floor as you can, and if you have any questions about where your DJ should set up, please ask him. It would probably be a good idea to schedule a meeting at the venue with your DJ so you can have this all worked out ahead of time. Once again if you have any questions at all, please feel free to contact me personally. Remember, we as DJ’s want to make your event the best that it can be. Stacey Noles is a professional mobile DJ in Pensacola, Florida. For more information please visit his company’s website at www.sndjpensacola.com. 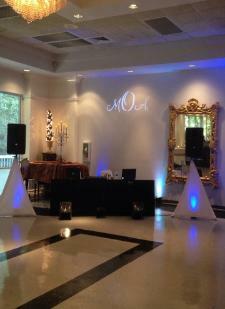 Brides and grooms on a tight budget….yes you CAN afford a professional DJ! How much does a professional DJ cost and how can I fit one in my budget? School dances, what all goes into them?